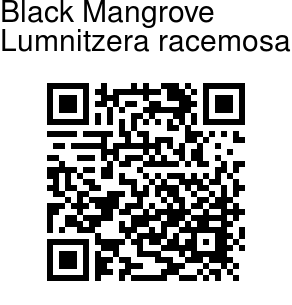 Black Mangrove is an evergreen, medium sized, erect and much-branched tree that grows up to 10 m tall but generally only around 4-6 m in height. Above-ground breathing roots are normally absent but in moist environments, small looping lateral roots may develop. Bark is gray in color and fissured longitudinally in older trees. Alternately arranged leaves are simple, small in size, 3-7 cm long and 2-3 cm wide, succulent, obovate in shape with a notch in the tip. Leaf margin is slightly wavy. Inflorescence is a spike, 2 to 3 cm long, in leaf axils. 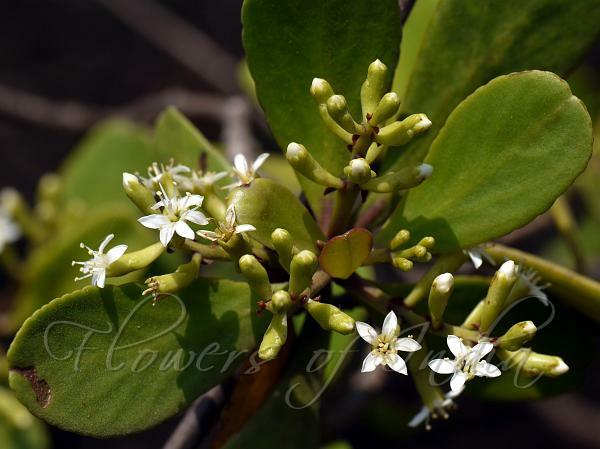 Flowers are small and erect with green-coloured tube-like calyx, which is divided into five sepals at the tip. Petals are five, white in color and arranged alternate to sepals. Stamens are 10 in number, free, arranged in 2 whorls, 5 stamens at the base of the petal and remaining 5 at the base of the lobes of the calyx. Fruit is vase-shaped, 1-2 cm long, yellowish green in color, glossy, corky, buoyant and dispersed by currents. Each fruit contains one oblong ovoid seed. Main trunk provides a hard and durable timber. In the Maldives, timber is used for wooden house construction and sticks of lesser diameter are used for rafters on wooden roof houses. Larger wood is sometimes used in boat building. Stems are used for pushing boats in shallow water. It is considered as excellent firewood. High-quality charcoal is prepared from larger stems. Photographed at Gorai Creek, Mumbai.